We brought my son to the Rainforest Cafe in the Mall of America for his 8th birthday. To my surprise, this was the first Rainforest Cafe to open it's doors 15 years ago. It's a fun place to eat with the surroundings that are part of the restaurant. There is a thunderstorm that rolls through every half hour, it rains in certain areas as well, lots of salt water fish tanks. There is so much to look at, you couldn't possibly see everything the first time you eat there. 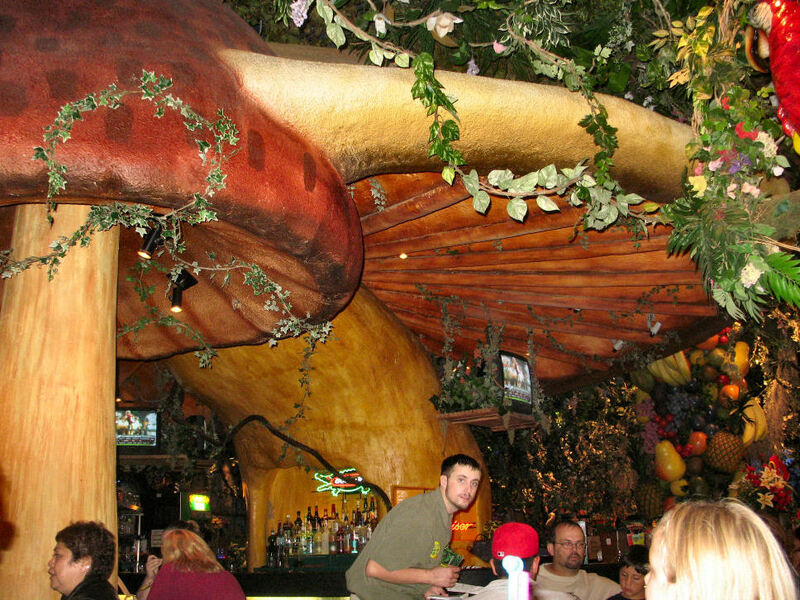 The bar area is built under a couple of very large mushrooms, which I didn't realize when I first sat down in my seat. This just in folks, the leaves are a changing. I repeat, the leaves are changing. In all seriousness, I'm not sure why the color change in leaves, which incidentally happens every year around the same time every year, brings out an over hyped media frenzy that gives us a fancy chart during the weather report of where the peak fall colors are taking place. Don't get me wrong, it is enjoyable to look at as this color change takes place over a few weeks of the year, but the way it gets reported is just a bit too much. Perhaps I'm not explaining it they way I want to exactly, perhaps some of you understand what I'm trying to say. I believe too many non-news stories get too much airplay and it becomes a giant yearly festival. 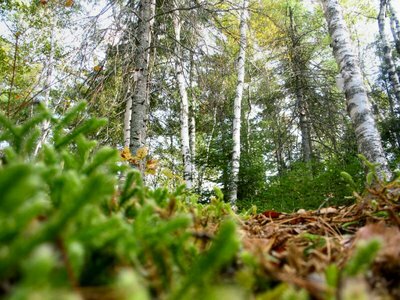 Okay, what I'm really trying to say is, fall is not my favorite time of the year because I know what is coming shortly afterwards....SNOW! Have no fear, I'll post this same bank of leaves about once a week so you all can see the changes and compare. 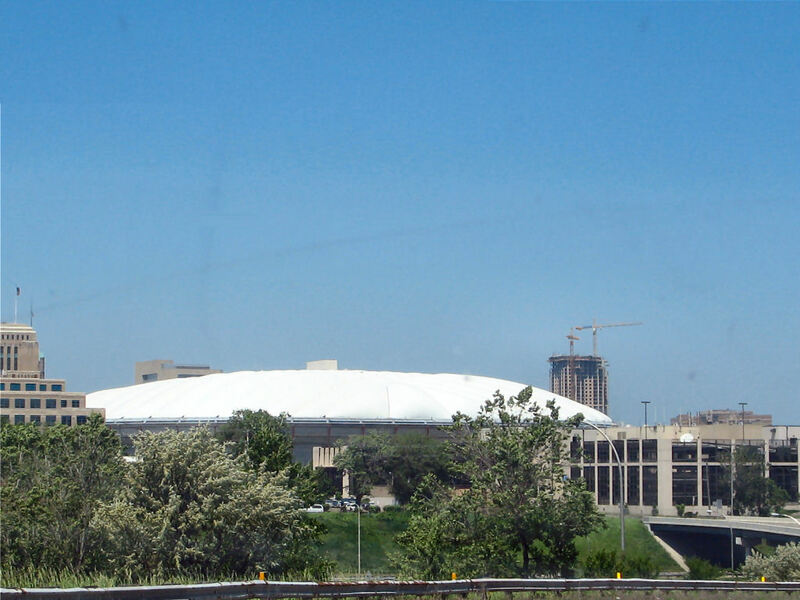 Just a view of the Hubert H Metrodome as you take the 5th street exit. In my attempt a interesting titles other than just what the photo obviously is, I made a stretch at today's attempt, eh? 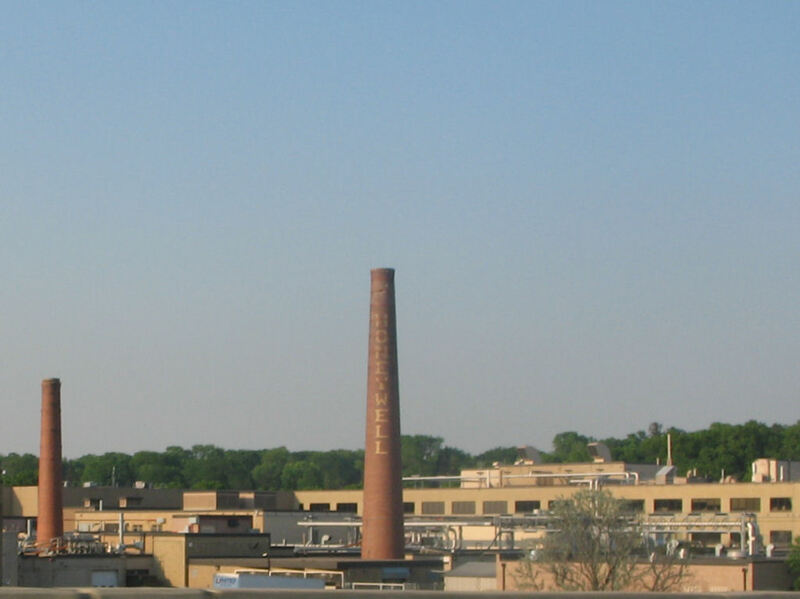 This smoke stack still bears the name Honeywell and I really have no idea if they are still there in that building or if someone else owns the building today. 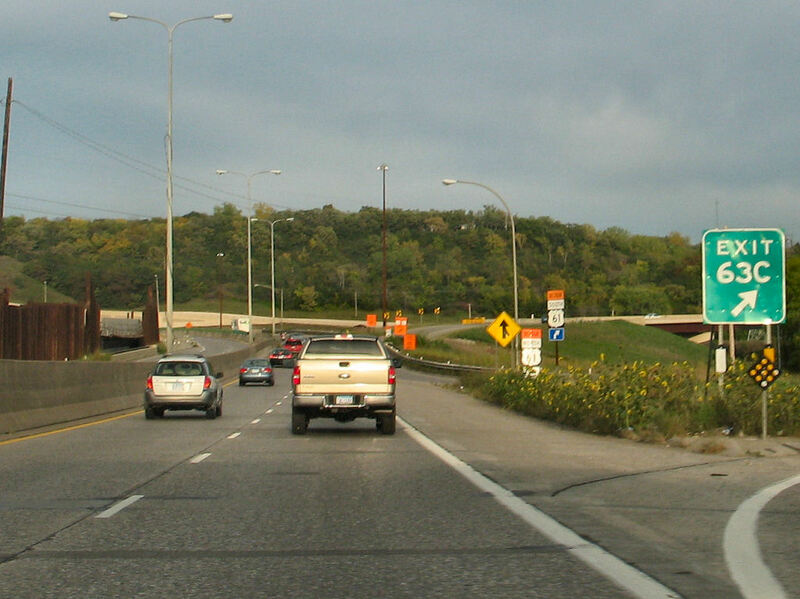 This plant is about 5 minutes north of downtown Minneapolis on Interstate 35W. I've driven past it many times in the past and had never noticed the words in the brick. Perhaps it was opening my eyes to what is out there since starting this photo blog site or perhaps it was just the angle of the suns reflections off the words at the time. Who knows. What's important is I finally saw it, and now you have too. This will be my final BWCA photo before getting back into the Twin Cities daily routine. I love the colors and the bug like perspective that this photo has. 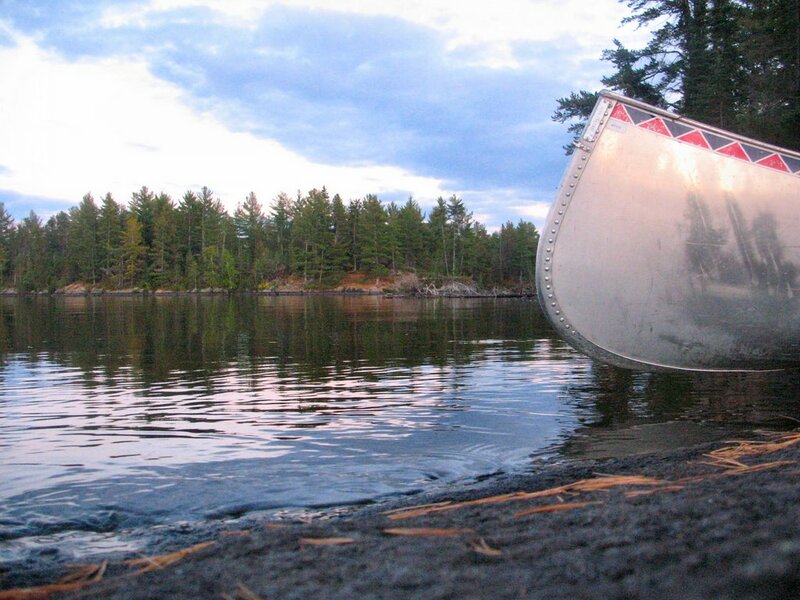 Took this photo during my Boundary Waters Canoe trip. 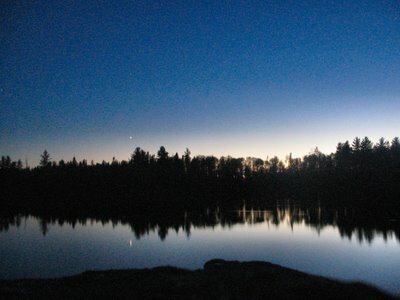 The sun was down and the planet Venus was the brightest object in the sky. It's so amazing to be away from the city lights and be able to see hundreds more stars in the sky without the lights of the city dimming what is normally visible. 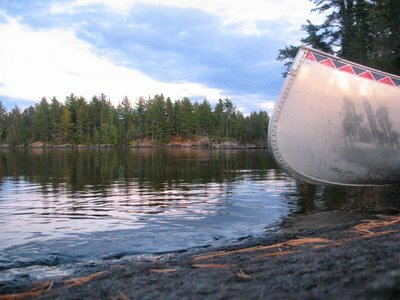 Spent a 6 days in the Boundary Waters Canoe Area in Minnesota with some family members. 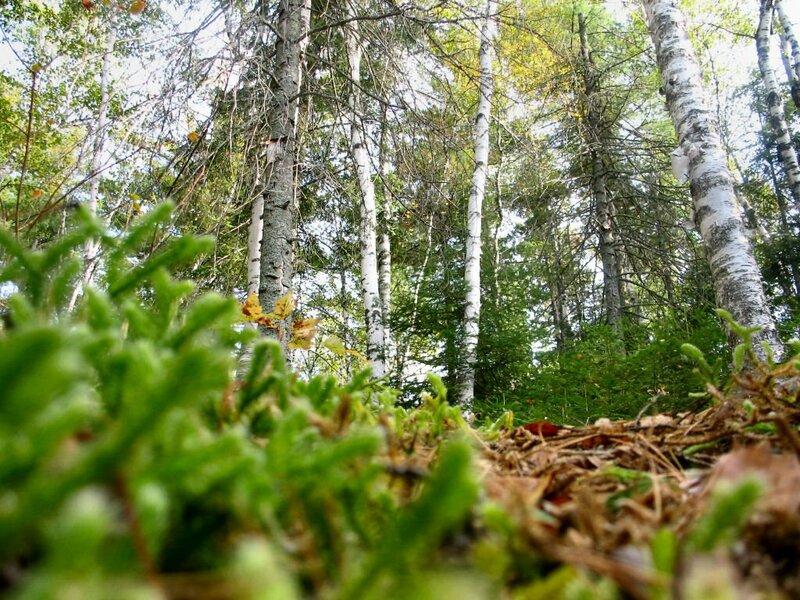 There was a lot of rain, cool temps, couple sunny days and a lot of scenery to take photos of. This is one photo from the trip I took. 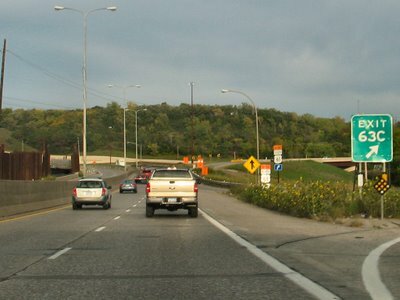 I'll have to create a site with more of my trip photos as some of them I really like, but they certainly are not from the Twin Cities. 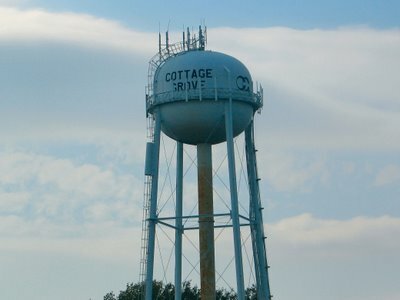 I do believe this water tower in my city could be the oldest in the town. There are several others, but they are in much better condition that this one appears to be in. There is something about water towers that can give a city character. I'm not sure if this water tower will be torn down or not. 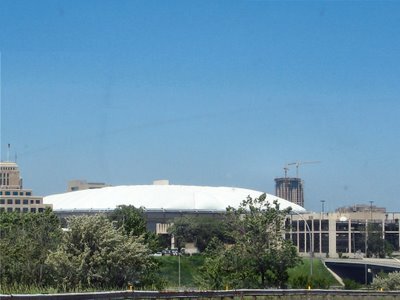 It sits on the edge of a lot that is soon to be destroyed and new living complex going in. It would be a shame to lose it, but perhaps it's not going anywhere. If it does, I have my picture of it and now you do to. Now I see why they painted the green stairwell green, it blends in with the rest of nature quite well. The building you see, is built into the side of the bluff. It has been many different establishments over the years. 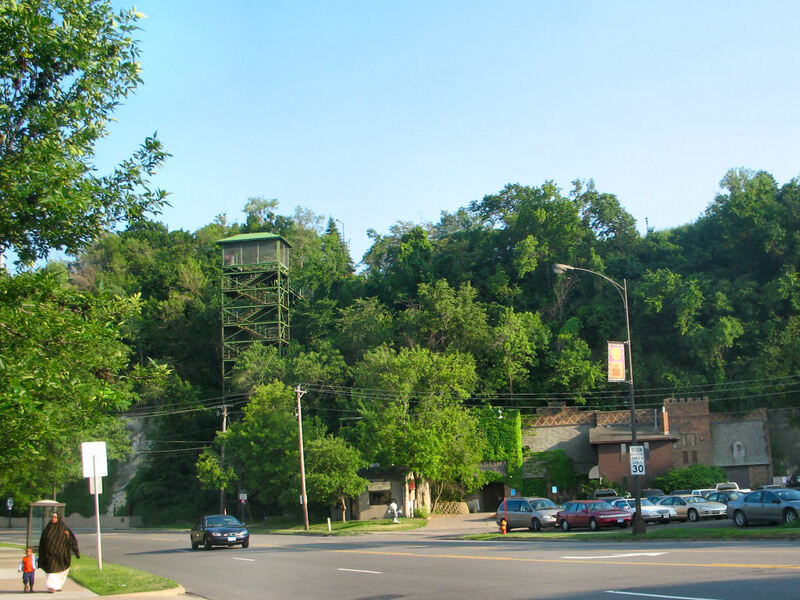 From what know, it's been a couple different restaurant, dance hall several times, winery, a hide out for gangsters, including I believe John Dillinger or at least that time frame. It's probably been a whole lot more that I'm not aware of. From my understanding, there is quite a set of caves dug into the sandstone bluffs it sits into. This will be my final photo from the 2006 Minnesota State Fair. 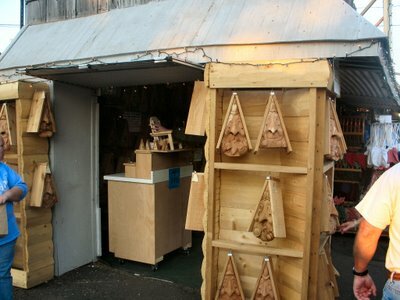 I was not going to post this photo originally, but I decided to post it anyways since I first found these great bird houses back in June 26. The birds fly in though the nose, build their nest and it's just fun to watch. 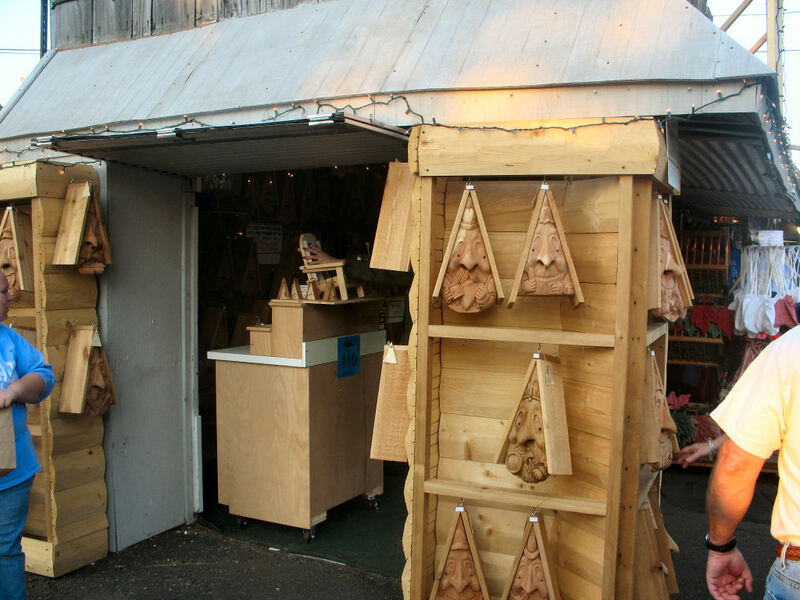 It was a great surprise to see these same bird houses represented at the State Fair. It's the perfect format for selling such and item and I hope they did well. I just may get one of them down the road. "Come along and ride on a fantastic voyage" yeah, I have that song stuck in my head right now looking at today's photo. It is a night shot at the Minnesota State Fair of the Giant Slide. This was always a childhood favorite growing up. I must say, I couldn't wait to take my two children on the slide when they were old enough. This slide was quite the attraction when it first opened up back in, I believe, the 1940's. Could be wrong on the build date, but it was some where around that time frame. You must walk all the way to the top of the slide using the stairs on the left hand side, while you carry a burlap sack up with you. There are microphones that pick up your screams, yells, laughter while you travel back down to the bottom. It's not to be missed. 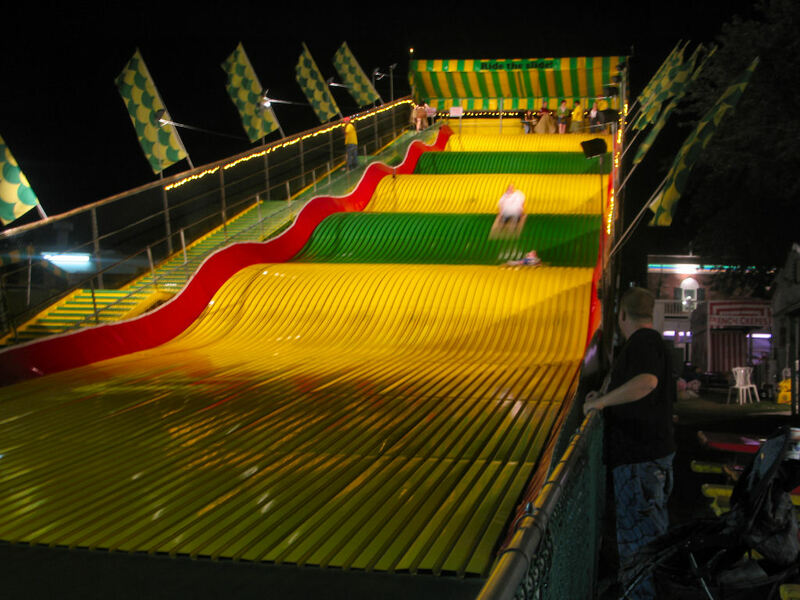 The total attendance for the 2006 Minnesota Stair Fair was 1,680,579. Not a record setting year, but the numbers were up from 2005. Only a die hard movie fan can name the movie quote in the title of today's posting. This photo was submitted from a co-worker, Dave R, he attended a Minnesota Twins vs Detroit Tigers baseball game this past Saturday. I'm drawing a blank unfortunately as to why he was on the field during batting practice, but it was part of a game day package that the Twins front office sent to him. 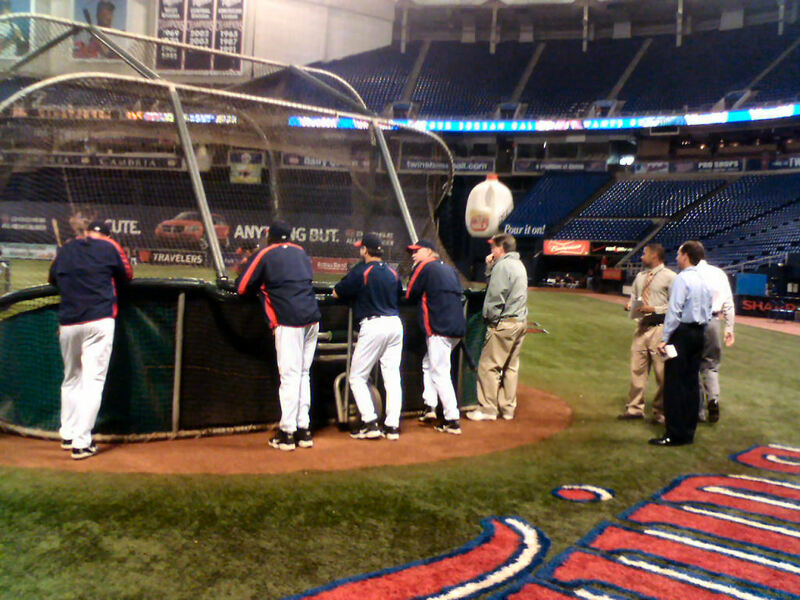 He was able to be on the field during batting practice, have a few autographs signed and he was able to take pictures. 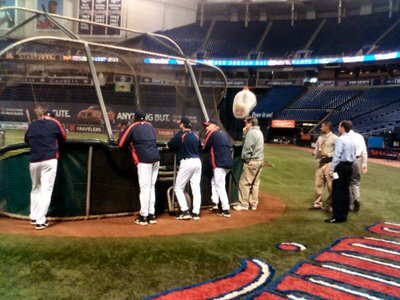 The Twins are creeping up on the slumping Detroit Tigers. It'll be a crazy last three weeks of baseball before the playoffs begin. 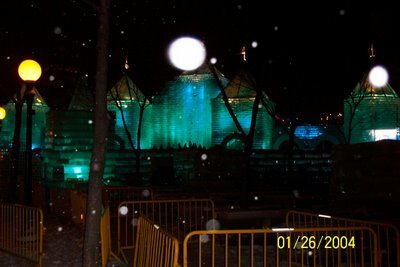 A distance shot of the main Ice Palace tower taken by Travis during the 2004 St Paul Winter Carnival. The white spots are snow flakes. 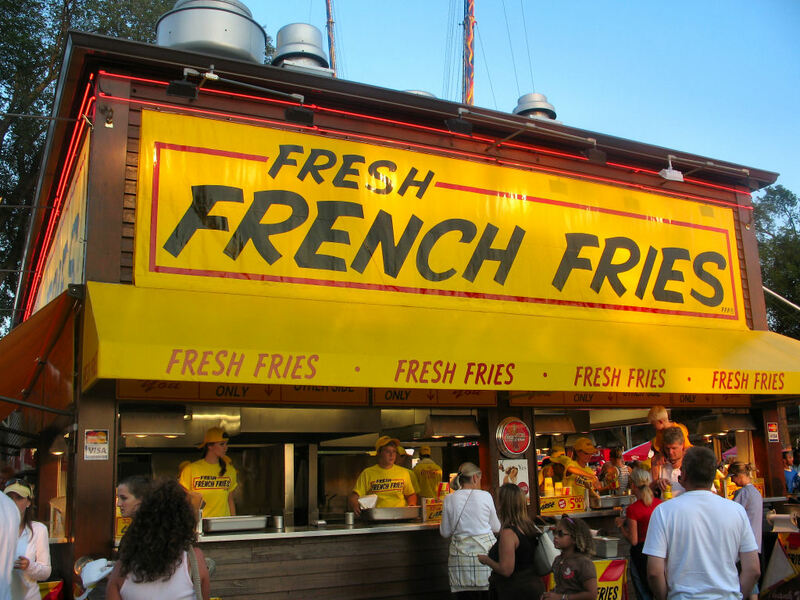 A huge part of the Minnesota State Fair is the food. From deep fried Twinkies to Spaghetti and Meatballs on-a-stick [no, that's not a misprint] to deep fried candy bars, my last daily photo entry of French Fries to my favorite, cheese curds. Most of the food booths specialize in one type of food at their booth. They all sell soda pop at each food stand to help increase their profit. When I was in high school and was barely working at the time, I had very little money to spend. I went to the fair every day that I could. I just wanted to people watch and look at the exhibits that I normally don't visit in a days time. 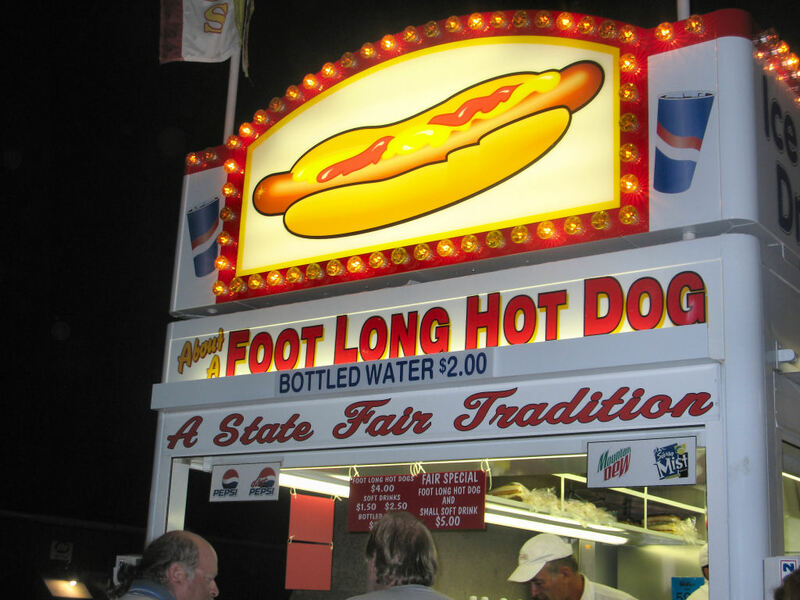 I still had to eat and found the best bang for your buck was to visit the foot long hot dog stand and then head over to the RC Cola booth for a soda as they had the lowest priced beverage at the fair. The french fries stand was the first place we hit for food. 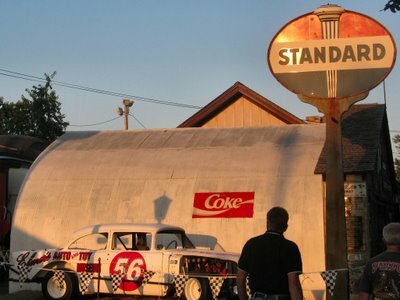 Always a good deal and the fries are always outstanding and quite the popular attraction. I am bummed my one photo I took of the Cheese Curds stand did not turn out. Nothing stays Minnesota State Fair like Cheese Curds. This was the first photo I took when I entered the Minnesota State Fair Grounds. As you can see by the shadows, the sun was nearly setting when I arrived so there was little time for any daylight photos. I was in the area that has a lot of historic value, some places to purchase items and of course food. The Standard sign was just screaming at me to take a photo of it with the suns glare bouncing off of it. 128,966 was the attendance for the day I was at the Minnesota State Fair. 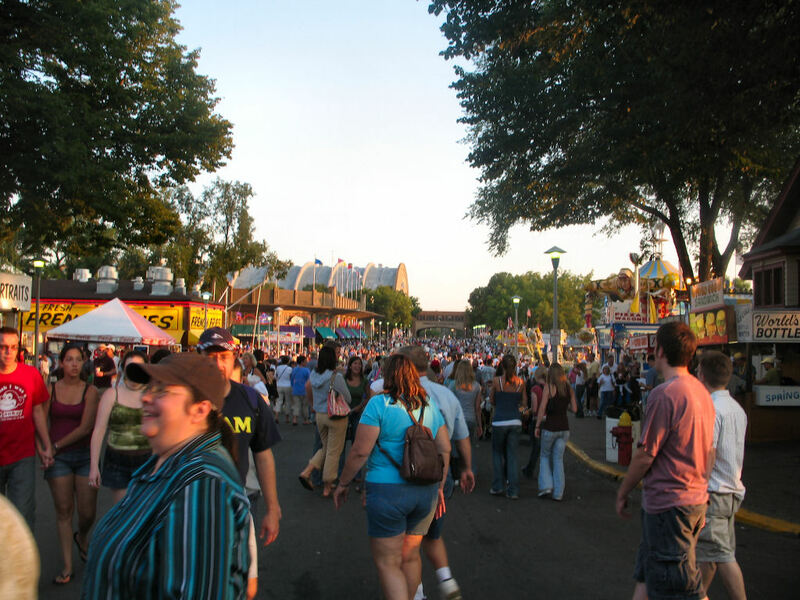 Labor Day was the final day of the fair's run. This street is one of the shorter streets where I am standing, but the sea of people is pretty much what every street looks like as you walk down the roads. 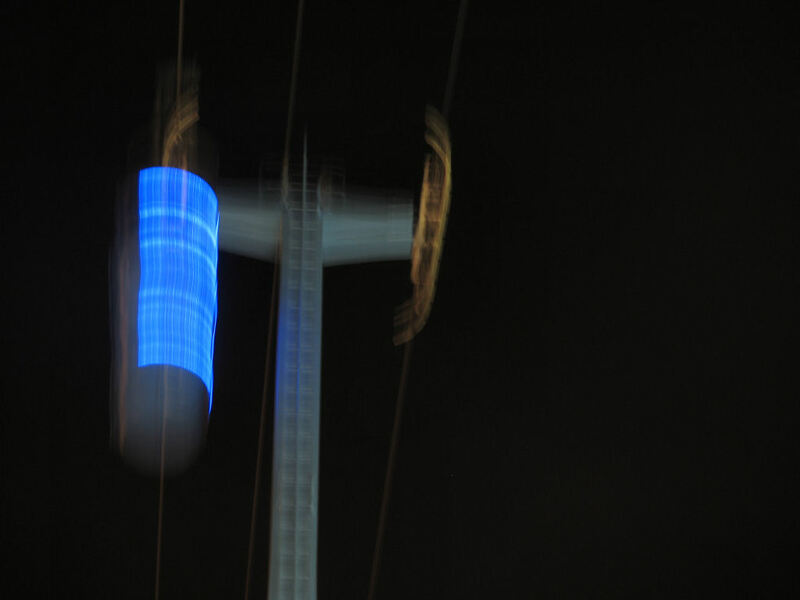 Today's photo coincides from yesterdays daily photo of the Skyride at the Minnesota State Fair. 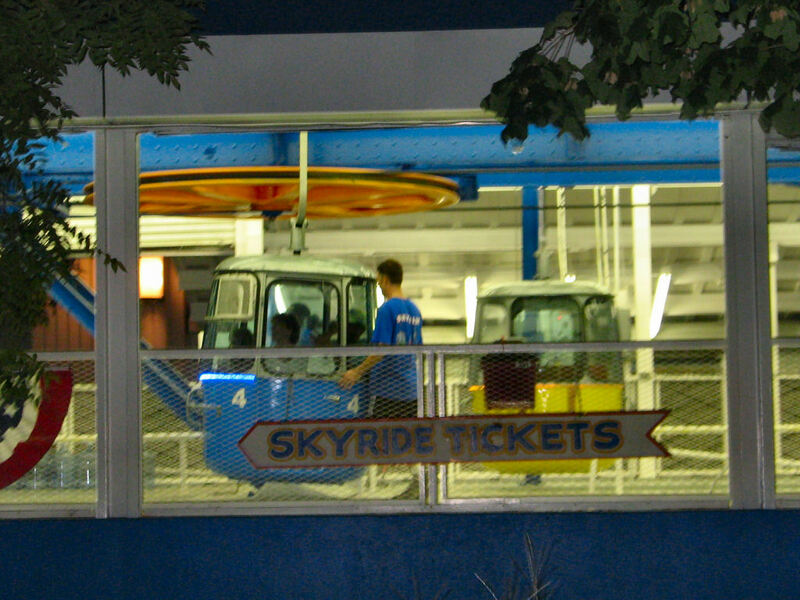 The cars on the Skyride go overhead on metal ropes strung between tall masts similar to what you would find on some skislopes high in the mountains. The blue streak of light is on the skyride cars, if you look at yesterday's photo closely, you can see a blue stripe of light above the number 4. That is what is displayed in today's photo with one of the support beams also in view. Made a quick visit to the Minnesota State Fair a few days ago. Here is the first shot of the Skyride that you can ride over a good majority of the fair grounds. 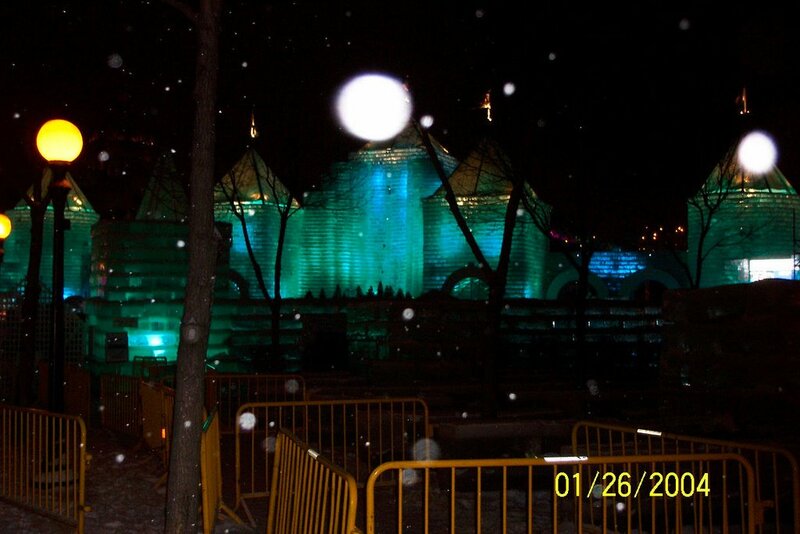 This is one side of the ride during the evening hours. 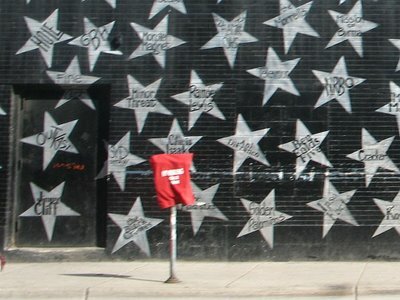 This doorway is on the side of First Avenue music night club, which hosts various musical artist, plus a few other activities. First Avenue was featured in my June 11, 2006 daily photo. 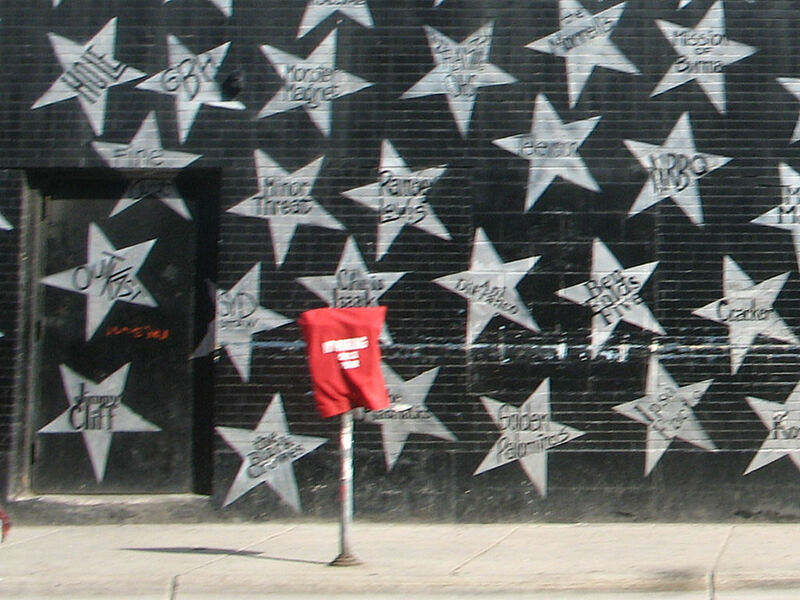 The entire outside of the building features the stars with the artists and bands that have performed previously at First Avenue.